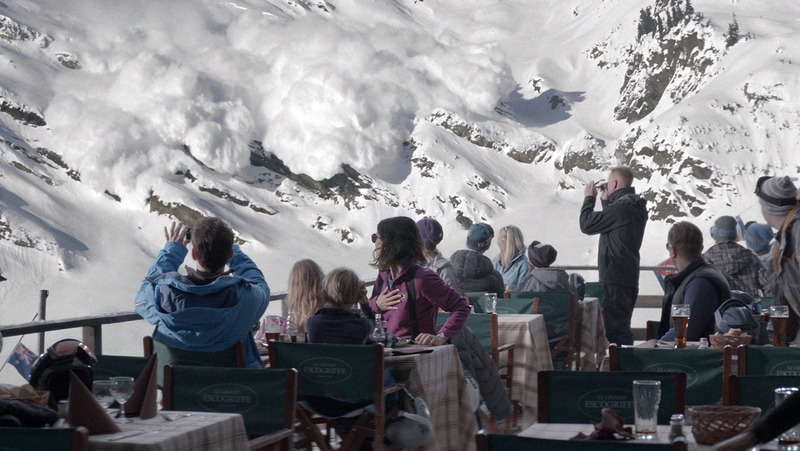 That's the question at the center of the wickedly chilly Force Majeure, a movie about a momentary decision that may lead to a lifetime of doubt. Can you live with that? Good question. In this film by Swedish filmmaker Ruben Ostlund, Tomas (Johannes Kuhnke) and Ebba (Lisa Loven Kongali) have taken their two small children -- both under 10 -- on a ski trip to the French Alps. But partway through the vacation, something happens that changes everything. The family is having breakfast before a morning of skiing, sitting on the outdoor veranda of a mountaintop ski lodge. There's the sound of an explosion in the distance: It's part of the regular effort to trigger controlled avalanches to make the slopes safer. As the family and the rest of the diners watch, a tidal wave of snow heads down the slope right toward the lodge. No worries, someone says, it will stop before it gets here. Except that it doesn't seem to be stopping -- and, as the cloud of snow thunders closer, Tomas and Ebba have starkly different reactions.